Background Despite the high rate of hamstring injuries, there is no consensus on their management, with a large number of different interventions being used. Recently several new injection therapies have been introduced. Objective To systematically review the literature on the effectiveness of therapeutic interventions for acute hamstring injuries. Data sources The databases of PubMed, EMBASE, Web of Science, Cochrane Library, CINAHL and SPORTDiscus were searched in May 2011. Study eligibility criteria Prospective studies comparing the effect of an intervention with another intervention or a control group without intervention in subjects with acute hamstring injuries were included. Data analysis Two authors independently screened the search results and assessed risk of bias. Quality assessment of the included studies was performed using the Physiotherapy Evidence Database score. A best evidence synthesis was used to identify the level of evidence. Main results Six studies were included in this systematic review. There is limited evidence for a positive effect of stretching, agility and trunk stability exercises, intramuscular actovegin injections or slump stretching in the management of acute hamstring injuries. Limited evidence was found that there is no effect of non-steroidal anti-inflammatory drugs or manipulation of the sacroiliac joint. Conclusions There is a lack of high quality studies on the treatment of acute hamstring injuries. Only limited evidence was found to support the use of stretching, agility and trunk stability exercises, intramuscular actovegin injections or slump stretching. Further research is needed using an appropriate control group, randomisation and blinding. The purpose of this study is to systematically review the literature on the effectiveness of therapeutic interventions for acute hamstring injuries. A comprehensive systematic literature search was performed in May 2011. The databases of PubMed, EMBASE, Web of Science, Cochrane Library, CINAHL and SPORTDiscus were searched without any time limits. The complete electronic search strategy is presented in table 1. In addition, citation tracking was performed by manual screening of the reference list of eligible studies. Two reviewers (GR and MHM) independently assessed potential eligible trials identified by the search strategy. The inclusion criteria are presented in box 1. All titles and abstracts were assessed by two reviewers (GR and MHM), and relevant articles were obtained. All relevant articles were read independently in full text by two reviewers (GR and MHM) to assess whether they met the inclusion criteria. If there was a difference in opinion on eligibility, a consensus was reached by consulting a third reviewer (JLT). One reviewer recorded the study design, population, intervention, outcome measure and outcome using standardised data extraction forms. To assess the efficacy of the interventions, we extracted mean values of the continuous outcomes and dichotomous values from the published articles. When a study had more multiple measurements of an outcome measure at different moments during the follow-up period, we used the results of the last recorded follow-up. The studies included were scored using the Physiotherapy Evidence Database (PEDro) score by two reviewers (GR and MHM).18 19 The PEDro score is an 11 point list using yes and no answers. The first statement pertains to the external validity of the study and is not used to compute the final quality score. The score (0–10) is the number of positive answers on questions 2–11. The PEDro items are shown in box 2. The reliability of the PEDro score is fair to good.19 A PEDro score of 6 or higher is considered to represent a high quality study, and a score of 5 or lower is considered to represent a low quality study.20 If there was a difference in opinion on a PEDro item score, a consensus was reached by consulting a third reviewer (JLT). The score is the number of positive answers on questions 2–11 (0–10). Strong evidence: provided by generally consistent findings in multiple high quality studies (≥75% of the studies reported consistent findings). Moderate evidence: provided by generally consistent findings in one high quality study and one or more lower quality studies, or by generally consistent findings in multiple low quality studies (≥75% of the studies reported consistent findings). Limited evidence: provided by only one study (either high or low quality). Conflicting evidence: inconsistent findings in multiple studies (<75% of studies reported consistent findings). No evidence: no randomised controlled trials (RCTs) or non-randomised controlled clinical trials (CCTs). The search yielded 975 records. Eight studies were identified as possibly relevant after screening of the titles and/or abstracts for which full text articles were retrieved. Citation tracking added one possibly relevant study. After review of the full text, three studies23,–,25 were excluded, and six studies26,–,31 met the inclusion criteria (figure 1). There were two CCTs27 28 and four RCTs with an adequate randomisation design.26 29,–,31 None of the included studies reported a sample size calculation. The PEDro scores for the six studies are shown in table 3. The scores ranged from 3 to 7, with an average of 5.0. Two studies were assessed as high quality (PEDro score ≥6),30 31 and four studies were of low quality (PEDro score <6).26,–,29 All studies reported the eligibility criteria. Four studies reported the grade of the hamstring injury as an inclusion criterion: three used a clinical assessment,27 28 31 and one used ultrasound for grading.29 However, no uniform grading system was used in these studies, making comparison unreliable. Participants with total rupture of the hamstring were not included in these studies. In the study of Cibulka et al,26 there was no difference in peak hamstring torque and passive knee extension test immediately after a single manipulation of the sacroiliac joint between the experimental group (peak torque 45.7±22.70 foot-pounds, passive knee extension 155.0±14.2°) and the control group (peak torque 46.4±17.47 foot-pounds, passive knee extension 144.6±16.7°). A significant difference between the experimental and control group in change in hamstring peak torque is reported in the article. This is due to a lower pretest peak torque of 8.4 foot-pounds in the experimental group. Kornberg and Lew27 reported a significant effect of slump stretching on games missed in 28 patients with hamstring injuries and a positive slump test. They used games missed as an indirect measure of time to return to sport (RTS). To obtain a dichotomous variable, one game missed was used as a cut-off point in the study. In the slump stretching group, 11 patients missed no games and one player missed one game or more compared with no players missing any games and 16 players missing one game or more in the control group (difference is significant, p<0.001). Approximation of time to RTS is not possible because of lack of information about frequency of matches during the study period. In the study of Lee et al,28 four patients with grade I injuries treated with actovegin injections returned to play on average after 12 days (±2.94) compared with 20 days (±4.45) for four patients with grade I injuries in the control group, a significant difference (p=0.033). Three patients with grade II injuries in the actovegin group returned to play on average after 18.7 days (±4.93). There were no patients in the control group with grade II injuries, therefore no statistical analysis was performed on grade II injuries. In the study of Malliaropoulos et al,29 the group that performed a more intensive stretching programme was found to regain full active knee extension compared with the uninjured side earlier than the group that performed a less intensive stretching programme (respectively 5.57±0.71 days and 7.32±0.525 days). Time needed for rehabilitation was also significantly (p<0.001) shorter in the intensive stretching group (13.27±0.71 days) than the less intensive stretching group (15.05±0.81 days). Reynolds et al30 found no statistically significant effect of treatment with NSAIDs (meclofenamate and diclofenac) on pain score and isokinetic hamstring testing (peak torque, average power and total work) compared with placebo. Pain scores measured with a visual analogue scale after 1 week were 7.9±6.6, 8.8±7.7 and 3.9±3.3 for the meclofenamate, diclofenac and placebo group, respectively. Adverse events were reported by 13 patients (29%): 12 gastrointestinal and one headache. Adverse events were reported by five of 13 patients (38%) in the meclofenamate group, six of 17 patients (35%) in the diclofenac group, and two of 14 patients (14%) in the placebo group. No statistical analysis was performed on the number of adverse events. Sherry and Best31 found no significant difference in time to RTS (p=0.2455) between a group performing stretching and isolated progressive hamstring resistance exercises and a group performing progressive agility and trunk stabilisation exercises (37.4±27.6 days and 22.2±8.3 days, respectively). This study reported significant re-injury rates in favour of the progressive agility and trunk stabilisation group at 2 weeks (p=0.0343) and at 1 year (p=0.0059) after RTS. At 2 weeks, six (54.5%) of the 11 patients in the stretching and isolated progressive hamstring resistance exercises group had a hamstring re-injury compared with none of the 13 patients in the progressive agility and trunk stabilisation. At 1 year, re-injury rate was 70% (7/10) in the stretching and isolated progressive hamstring resistance exercises group and 7.7% (1/13) in the progressive agility and trunk stabilisation exercises group. This systematic review shows limited evidence for a positive effect of stretching, agility and trunk stability exercises, intramuscular actovegin injections and slump stretching in the management of acute hamstring injuries. Limited evidence was found that there is no effect for NSAIDs and manipulation of the sacroiliac joint. Only six studies met the criteria for inclusion in this systematic review—two CCTs27 28 and four RCTs26 29,–,31—of which two were classified as high quality. These six studies all investigated different interventions, thereby limiting comparison of the studies and pooling of the results. Despite hamstring injuries being very common in the athletic population, this comprehensive systematic literature search revealed a lack of high quality studies on their management. All interventions reported in these clinical studies have been investigated once, limiting the amount of evidence on their efficacy. There was limited evidence for a positive effect of stretching on the time required for rehabilitation. Malliaropoulos et al29 reported a positive effect of static stretching on the rehabilitation time. In contrast, the group that performed stretching and progressive resistance in the study of Sherry and Best showed a tendency to prolonged rehabilitation time compared with the agility and trunk stabilisation group. However, no conclusions can be drawn on the effect of stretching as an isolated intervention from the results of Sherry and Best31 because resistance exercise was another variable that may influence the outcome besides stretching. There is limited evidence that agility and trunk stabilisation exercises compared with progressive resistance and stretching resulted in fewer re-injuries at 2 weeks and 1 year follow-up. The re-injury rate of 70% at 1 year follow-up found in the progressive resistance and stretching group in the study of Sherry and Best is higher than reported in the literature for hamstring injuries.7 32 33 This may indicate that the rehabilitation programme in this group has a detrimental effect on the rehabilitation outcome. There is limited evidence that the use of NSAIDs has no effect on pain scores and isokinetic strength testing in acute hamstring injuries. Similar to these results, a number of reviews found NSAIDs to be no more effective than placebo in the management of acute soft tissue injuries.9 10 34 Furthermore, concerns have been raised about the possible harmful effect of NSAIDs on muscle healing after acute injury, because of delaying muscle regeneration and promoting fibrosis.34 35 Despite the widespread use of NSAIDs in acute muscle injuries, there is no evidence for their efficacy for hamstring injuries. Kornberg and Lew27 reported a reduced number of games missed with the use of stretching of neural structures (slump stretching) in athletes with grade I hamstring injuries and a positive slump test. Grade I injury was defined as pain and tenderness in the hamstring, pain and decreased strength on isometric contraction, and decreased hamstring length. Diagnosis was not confirmed by ultrasound or MRI. In the experimental group treated with the slump stretching technique, 11 of the 12 athletes missed no games. Compared with rehabilitation times for grade I injuries found in the literature, it is remarkable that these players did not miss any games. This raises the question whether these injuries actually contained hamstring muscle pathology or whether there was another cause of the injury, such as neural tension pathology. Cibulka et al26 reported an increase in peak hamstring torque after manipulation of the sacroiliac joint measured with a pre- and post-intervention test. Peak hamstring torque did not increase in the control group. However, there was a baseline difference in peak hamstring torque in favour of the control group. At the post-test, the groups were similar. This significant baseline difference makes the interpretation of the outcome difficult and causes a substantial risk of bias. Furthermore, there are several other limitations in this study: no information is provided about the sport activity of the participants, the criteria for the diagnosis of sacroiliac dysfunction are not clear, and there is no rehabilitation outcome presented in measurements of time to RTS and re-injuries. In recent years, injection therapies, such as actovegin8 28 and growth factor,15 23 have gained popularity for the treatment of muscle injuries. Lee et al28 reported a significantly shorter rehabilitation time for treatment of acute hamstring injuries with actovegin compared with no injection therapy. However, there is a substantial risk of bias in this study due to serious methodological limitations: no randomisation, no blinding, and the allocation of patients who refused the injection therapy to the control group. Therefore no conclusions can be drawn about the efficacy of actovegin injections for hamstring injuries. Surgical treatment has been advocated to repair complete ruptures of the hamstring muscles and is increasingly used in the management of these injuries.16 36 37 Although a surgical intervention was not an exclusion criterion, no studies on surgical treatment of acute hamstring injuries were included in the analysis of this systematic review. In the literature search, no prospective controlled studies on surgical interventions for acute hamstring injuries were identified. This highlights the lack of high quality scientific evidence in the surgical management of acute hamstring injuries. This systematic review highlights a lack of good quality studies on the treatment of acute hamstring injuries. Common methodological limitations are small number of participants, lack of an appropriate control group, lack of randomisation and lack of blinding of patients, therapists and assessors. Grading systems are used for classification of severity of acute hamstring injuries.38 39 However, there seems to be no uniform classification system for these injuries: grading is performed using clinical examination,27 28 31 MRI38 and/or ultrasound.29 39 In a general sense, these grading systems share common classification categories (grade 0, no abnormality; grade 1, no/minimal tear; grade 2, partial tear; grade 3, total rupture), but the precise definitions vary between the classification systems. The exact distinction between no, minimal and partial tear is not uniform. Of the studies included, four graded the injuries using different classification systems,27,–,29 31 making comparison unreliable. The reliability of these classification systems in clinical practice has not been investigated. This highlights the need for a uniform, reliable and validated classification system, which will improve the comparability of outcomes and can be used by sport physicians for management planning, prognostication and RTS decisions. The outcome measures used in different studies on hamstring injuries are heterogeneous, limiting the comparability of the studies. The most common outcome measure reported is time to RTS. In the practice of sports medicine, this is an important measure of the success of treatment, especially for professional athletes. Regarding the high re-injury risk of hamstring injuries, another important outcome measure for assessing the effect of an intervention is the re-injury rate in the follow-up period after RTS. An intervention may seem to be successful when athletes can return to play earlier. However, if the risk of re-injury is high, the success of the intervention is at least questionable. It is suggested that both time to RTS and re-injury rate should be measured to determine the efficacy of an intervention in athletes with acute hamstring injuries. Three of the studies included reported time to RTS,28 29 31 and only one reported the re-injury rate.31 Validated outcome measures need to be developed. Despite acute hamstring injuries being common in athletes, there is a lack of high quality studies on their treatment. In this review, only limited evidence was found for a positive effect of stretching, agility and trunk stability exercises, intramuscular actovegin injections and slump stretching as treatments. Limited evidence was found that there is no effect of NSAIDs and manipulation of the sacroiliac joint. Further research using an appropriate control group, randomisation and blinding is needed. It is recommended that future studies assess the efficacy of interventions using time to RTS as well as re-injury rate.
. Epidemiology of injuries in the Australian Football League, seasons 1997-2000. Br J Sports Med 2002;36:39–44.
. Anti-inflammatory treatment of muscular injuries in sport. An update of recent studies. Sports Med 1999;28:383–8.
. Practical management: nonsteroidal antiinflammatory drug (NSAID) use in athletic injuries. Clin J Sport Med 2006;16:170–4.
. Hamstring injuries: anatomy, imaging, and intervention. Semin Musculoskelet Radiol 2010;14:131–61.
. 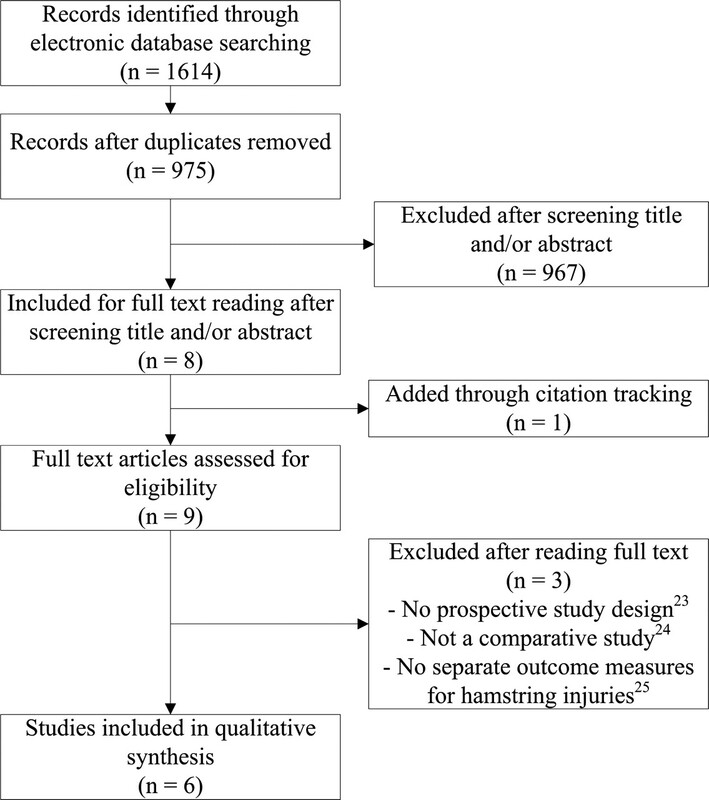 Treatment of proximal hamstring ruptures - a systematic review. Int J Sports Med 2011;32:490–5.
. Rehabilitation for hamstring injuries. Cochrane Database Syst Rev 2007;24:CD004575.
. The PEDro scale is a valid measure of the methodological quality of clinical trials: a demographic study. Aust J Physiother 2009;55:129–33.
. Rating the quality of trials in systematic reviews of physical therapy interventions. Cardiopulm Phys Ther J 2010;21:20–6.
. The acute effects of local vibration therapy on ankle sprain and hamstring strain injuries. Phys Sportsmed 2009;37:31–8.
. Immediate external compression in the management of an acute muscle injury. Scand J Med Sci Sports 1997;7:182–90.
. Non-steroidal anti-inflammatory drugs for athletes: an update. Ann Phys Rehabil Med 2010;53:278–82, 282–8.
. Acute proximal hamstring rupture. J Am Acad Orthop Surg 2007;15:350–5.
. Isolated avulsion of the biceps femoris insertion-injury patterns and treatment options: a case report and literature review. Arch Orthop Trauma Surg 2007;127:777–80.